At times, and in certain weather conditions, there is nothing that soothes the moment and pushes back against the cold like a good old cup of tea with a clean, distinct flavour! Even without the cold, a good cup of our favourite tea is just the thing to help us undo the knots and let our hair down. No elaborate, fancy affair, no pomp and pleasantries; just the simple, warm, flavourful delight of a good old faithful – a common cup of tea. But what a thing when it spills! A good tea is likely to leave a mark where it falls; its stubborn stain posing as the representative of its strength and character. It may not be such an issue if where it falls can be easily cleaned. Like a counter top or coffee table. Tea spills on a carpeted floor, however, pose quite a different kind of challenge. Because cleaning tea stains from textile surfaces, like the carpet, is not as simple as with hard surfaces, especially with stains of strong character. 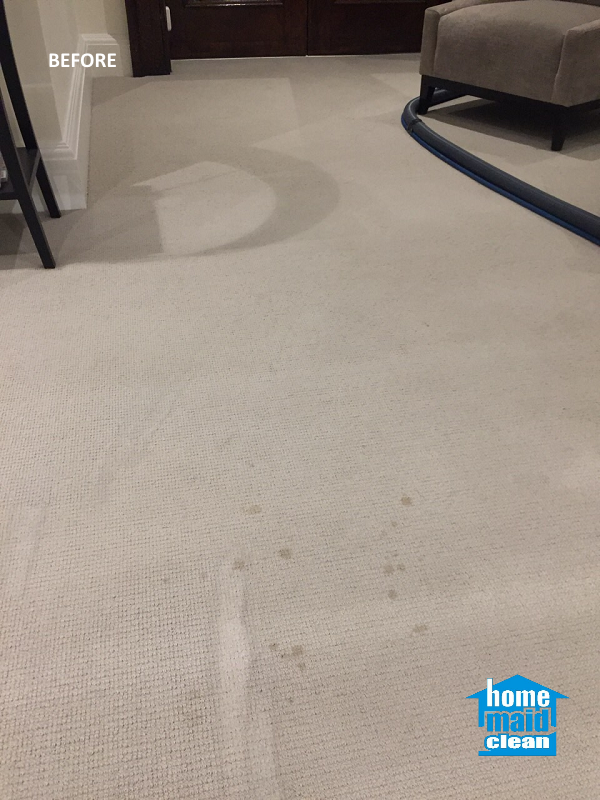 Our customer faced a real problem having a stubborn tea stain land on their beige living room carpet. Naturally, as this is where our household and guests would likely have a cup of tea. One tiny spill, another and another…and in short order the carpet could start looking like it has never been cleaned. Swiftly responding to the customer’s request for a cleanup, our carpet cleaning technicians arrived at the customer’s location and approach this carpet cleaning case per our 9-step professional carpet cleaning process. First they assessed the living room carpet (including how furniture could be repositioned to facilitate cleaning) to determine how to get the carpet cleaning done in the most efficient and effective way. After the most appropriate for the carpet colour and fibres cleaning method was determined, the carpet was dusted and vacuumed prior to executing the application of treatments and cleaning detergents. The stained areas were then treated so that the carpet steam cleaning would be maximally effective! The kinds of teas that caused the carpet stains and their strength of character was no match to the skills of our professional carpet cleaners, our carpet cleaning techniques and our state of the art equipment and products (see our post on a recent upgrade in our carpet cleaning equipment)! 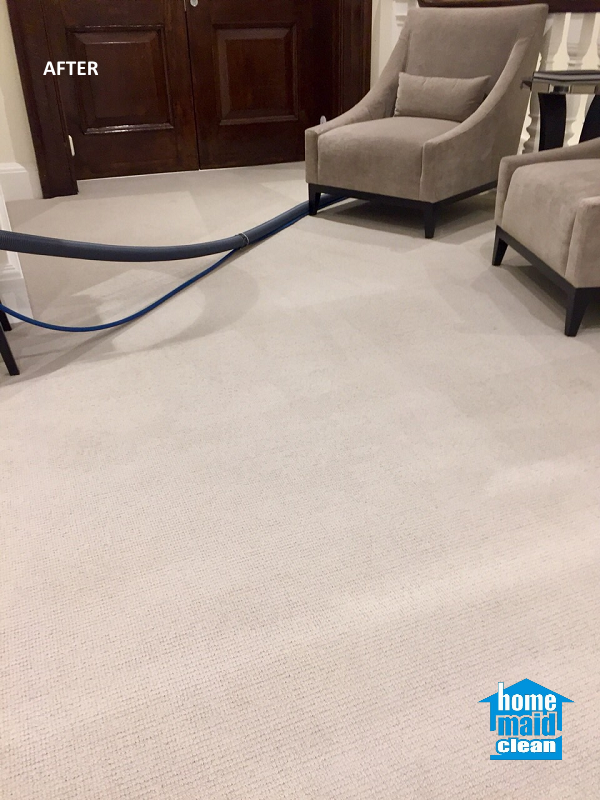 This light-coloured, fine carpet was steam cleaned with brilliance to a welcomed newness, much to the delight of our customer. In addition to the tea stains being completely removed, all dirt, dust and allergens captured deep into the carpet fabrics had been removed. The carpet smelled and looked fresh and perfectly clean. Check out our steam carpet cleaning service and call us to book a cleaning slot for you. We will clean even the most intense carpet stains, including stubborn stains on delicate and light-colour carpeted surfaces. Our carpet cleaners clean everywhere in London and can be booked at short notice at no extra charge!